And finally, Baku City Circuit (BCC) announced who will close out the Formula 1 Azerbaijan Grand Prix 2019 on Sunday April 28. This will be one of the most electrifying artists in world music, Cardi B, capping off a weekend of thrilling action and entertainment in the Pearl of the Caspian. From 2015 to 2017, she appeared as a regular cast member on the VH1 reality television series Love & Hip Hop: New York. In February 2017, she signed her first major label record deal with Atlantic Records. Her debut single for Atlantic, titled "Bodak Yellow", reached number one on the US Billboard Hot 100 chart, making her the second-ever female rapper to do so with a solo output. She released the single "Be Careful" on March 30. Her debut studio album Invasion of Privacy was released on April 6, 2018. Additionally, speaking after this announcement, BCC’s Executive Director, Arif Rahimov, was delighted to welcome Cardi B to Baku in April. “We are absolutely thrilled that one of the most talented and exciting artists working in music today will be closing out our race weekend this year. In only a short space of time, Cardi B has already established herself as one of the most original and influential voices in music, with a style and attitude unlike any artist performing today. 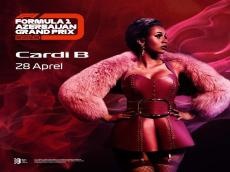 As with Baku City Circuit, when it comes to a Cardi B show one thing is guaranteed: expect the unexpected. As such, she is the perfect act to close out our race weekend and send the fans home smiling from ear to ear. I cannot wait to see and hear her perform live at the Crystal Hall on April 28th. Make sure you get your tickets while you still can and enjoy this incredible weekend with us here in Baku,” Rahimov stated.